I want to alert all of you that the Electronics Flea Market season is starting very soon. We have received an agreement from Fry’s Electronics to hold the flea market at their Sunnyvale location again for 2019. We have looked at the costs for 2019 and determined that the fee for this season will be $600 per event. You should use this number for planning and budgeting purposes. We will begin sending out the official invoices to the first groups early next week once the ASVARO board has approved it. Saturday Mar. 9 Flea Market – Hosted by Palo Alto Amateur Radio Association. Saturday Apr. 13 Flea Market – Hosted by South Peninsula Amateur Radio Klub. Saturday May 11 Flea Market – Hosted by Santa Clara County Amateur Radio Association. Saturday June 8 Flea Market – Hosted by Southern Peninsula Emergency Communications System. Saturday July 13 Flea Market – Hosted by Foothills Amateur Radio Society. Saturday Aug. 10 Flea Market – Hosted by Silicon Valley Emergency Communications System. Saturday Sep. 14 Flea Market – Hosted by West Valley Amateur Radio Association. Tonight, Wednesday February 13th, we will be having, via Zoom, Dave Casler, telling us about Digital HF Modes! Dave’s Biography is in the Het, And he has Hundreds Of Presentations on UTUBE, covering Topics from your 1st Station, To courses on Technician, General and Extra Licenses, helpings Thousands Of People Get Their licences! I’m Sure that we’ll All enjoy and Learn from Dave’s Presentation Tonight! I’ll look forward to seeing you at tonight’s meeting! Many will be at Dish-n-Dash for pre-meeting dinner. 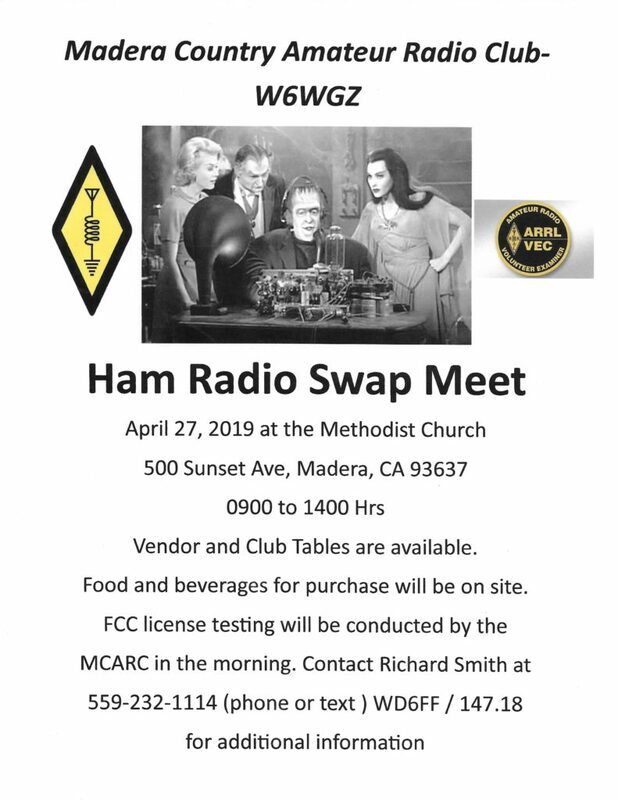 Ham Radio Swap Meet, April 27 at the Methodist Church, 500 Sunset Ave, Madera, CA 93637. 9:00 to 14:00 hours.